I adjusted to my flip phone. 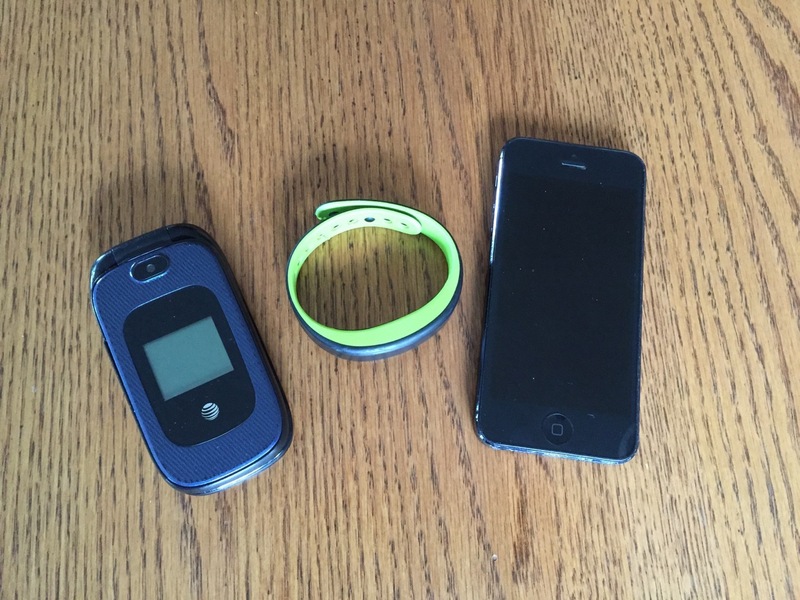 I liked its compact size—I was still getting in the habit of having my phone always on me, and it fit comfortably in a pocket when at home or in my wristband wallet when I hiked the trails around our house. Christmas 2014: I received an activity tracker from my husband. He had a heck of a time finding one that would sync with my computer, as most trackers are set up to sync with smartphones as apparently the entire world except me now has a smartphone. My Garmin Vivosmart is like wearing a watch again—sort of cool not to have to pull out my phone to check the time. Besides counting my steps, it buzzes and the screen reads, “Move!” if I haven’t moved in an hour—I love this feature, even if I don’t always obey its command. My tracker is waterproof—I wear it 24/7, and realized this is a step in the direction of barcodes on our bodies or embedded chips, and really, all ethical questions aside, how convenient would that be—to not have to carry cash or a credit card, or ID, and know how close you came to 10,000 steps each day. This last fall, my husband upgraded to the iPhone 6 and offered his iPhone 5 to me. I certainly didn’t want a 6—too big. I put his 5 in my small Brenthaven purse—fit fine. Wristband wallet—no way. I would have to put it in a pocket or carry it. Or get one of those upper arm cases that make you look part cyborg. So I succumbed to the smartphone. Five months later, I have yet to access my email through my iPhone or download a single app. I use it primarily as a phone. Though the map feature with voice directions is pretty nifty, and taking photos for my blog is a whole lot easier. But the new feature that I use the most, the feature that makes toting a larger phone completely worth it, is the flashlight. I use it to locate cat toys under the furniture, to navigate stairs, to find house keys hidden in the depths of garages. If I had known how much I would use the flashlight feature, I would have gotten a smartphone years ago. Are you a smartphone hold out? If so, why? Love your smartphone? What’s your favorite feature? Love to hear from you in the comments. Now my husband is the last smart phone hold out! You ‘ll have to tell me how you use it for notes. I just use the flashlight. I just started using the recorded notes – get an idea and talk into the phone. Pretty cool.